ORIENT PUBLICATION: The 13th Emerging Economies Group meeting. The 13th Emerging Economies Group meeting. 13th Emerging Economies Group meeting was hosted on 08-09 May 2017 in Mumbai. This event was last hosted in India in the year 2011. The EEG is a good technical platform for emerging economies to communicate and exchange views on the development and implementation of IFRS Standards. The IFRS Foundation decided to form the EEG following the G20 urging to increase the participation of emerging economies in the development of IFRS standards by the IASB. Generally, two meetings of EEG are held every year, for which the member countries take turn hosting them. This year is important for Accounting Standards Board of ICAI as it has completed 40 years of its existence on April 21, 2017. Besides EEG, ICAI is part of various other international bodies such as International Federation of Accountants (IFAC), Asian-Oceanian Standard-Setters Group (AOSSG), International Forum of Accounting Standard Setters (IFASS) etc. Agenda topics of EEG meeting included discussion on IFRS 15, Revenue from Contracts with Customers by IASB. Globally, IFRS 15 is proposed to be effective from 1 January 2018. India is expected to implement Ind AS 115 from 1st April, 2018 which will have impact on revenue recognition of almost every company. Also, at the meeting, a paper was presented on High Inflation by the GLASS. Challenges faced by SMCs/SMEs/Micro-entities in accounting weree also highlighted in the paper so that IASB may consider formulating new financial reporting Standards for such entities. 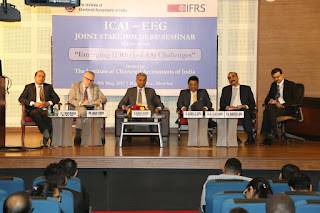 EEG meeting was followed by a half day ICAI – EEG Joint Stakeholders Seminar on ‘Emerging IFRS (Ind AS) Challenges’ held on 9th May whereat discussion on IFRS 9 and IFRS 15 took place. 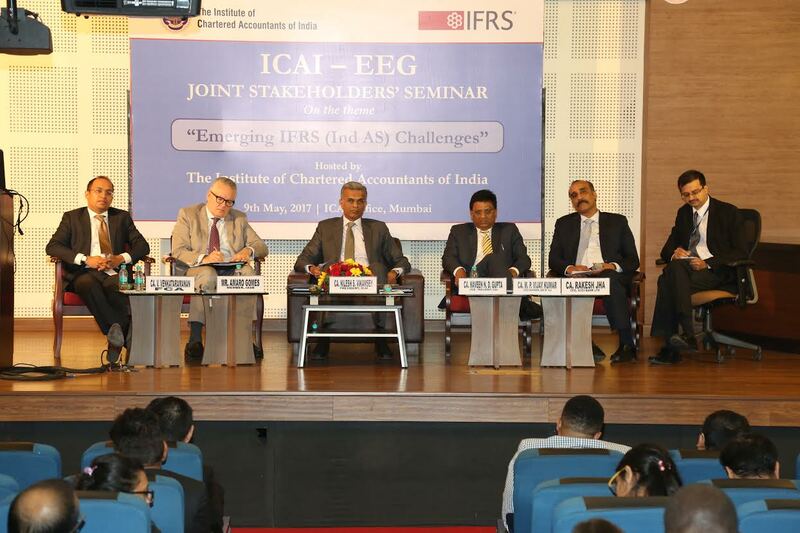 The panellist included distinguished professionals from IASB (London), ICAI, RBI, Accounting Firms and Industry. Around 270 professionals were invited to attend ICAI – EEG Joint Stakeholders Seminar Invitees to the Joint Stakeholders’ seminar from the industry, statutory bodies (RBI, SEBI, IRDA etc), renowned accounting and auditing firms. As a standard setter of a large emerging economy, ICAI looks forward to contribute to such global forums and take up emerging accounting issues for discussions at international level. Working in tandem with these international bodies gives an opportunity to flag the Indian concerns at global level for timely addressing the same.